Google Adwords is one of the best forms of advertising today — but you need to use it properly to avoid wasting money. Copy Army helps businesses maximize results and minimize costs to unlock the full power of Adwords. Our skilled professionals will set up your account and actively manage it to ensure you’re constantly reaching your online advertising goals. Why is management so important? Anybody can set up an Adwords account and start getting clicks. But the question is: who is clicking on your ads, and how much are those clicks costing you? If you’re not careful, you’ll waste money on clicks that never generate a sale, due to mistakes in your campaign settings and your overall Adwords strategy. These mistakes ultimately result in: 1) Worthless clicks from people didn’t search for anything related to your business; and 2) Unnecessarily high costs per click — often 300-400% higher than what you should be paying, due to the settings in your account! To make matters worse, Google penalizes accounts with poor performance. So if you’re campaign is set up improperly or not generating good click rates, you’ll be charged more for those clicks. Our Adwords specialists actively manage your account to ensure you’re never paying more than you should for clicks. 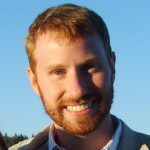 Mike Marlin, Search Marketing Director. Led by Search Marketing Director Mike Marlin, Copy Army uses the latest best practices for Google Adwords to maximize your ROI. We keep your costs as low as Google will allow, while delivering greater results than if you managed your account yourself. 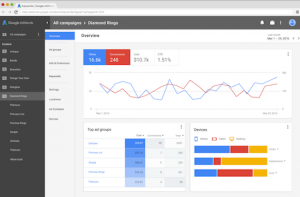 We stay on top changes and new features within the Adwords system that affect your ad performance, so you don’t have to. At the end of each month, we send you a customized report that clearly spells out your performance and the steps we took to improve it. 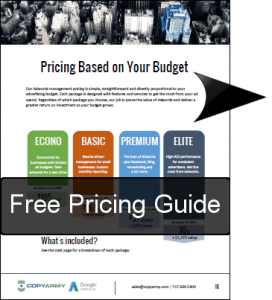 Download our free pricing guide. To view our Adwords management pricing, please fill our the form on the right to download our free 2016-17 pricing guide or email us at ppc@copyarmy.com.